I'm sure you must have read Roald Dahl's book, Charlie and the Chocolate Factory. The fictional chocolate master, Willy Wonka and his wonderful factory was a childhood favourite story of mine. 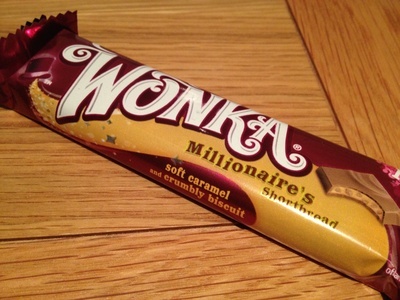 So, when I saw a chocolate bar called Wonka, I had to take a closer look. There are a wide range of product's within Nestle's Wonka range from sweets to chocolate I selected the Millionaire's Shortbread. On first observations after unwrapping my treat, I was initially a little disappointed. It looked very standard. However, one bite and I changed my mind. 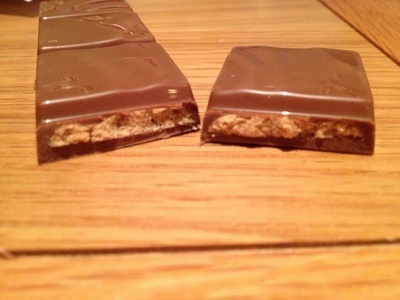 I love millionaire's shortbread and in this chocolate bar version is works perfectly. There's a decent layer of chocolate all around. The biscuit part is suitably soft and crumbly as you would expect from a traditional piece of millionaire's shortbread. I also really enjoyed the caramel being a lovely liquid consistency.